We would like to introduce you to the newest member of 1465 or Bust: Darlington (aka Darla). Darlington was a rescue dog Josh adopted from the very caring people of Canine Lifeline in March. She had been picked up as a stray in Kentucky about a year ago and has bounced around Ohio since then. Darlington is fitting in nicely. She loves car rides and lounging around, so marking hunting is a good fit! Hopefully she continues to tolerate our wanderlust lifestyle and complete this monumental project with us. What kind of history geeks would we be if we didn’t explain that she is named after “the fighting Quaker” Gen. Smedley Darlington Butler; one of the country’s most decorated marines. Later in life he became a vocal opponent to war and American expansionism. In 1933 he was instrumental in exposing The Business Plot (a planned coup by military officials and wall street executives to depose FDR). 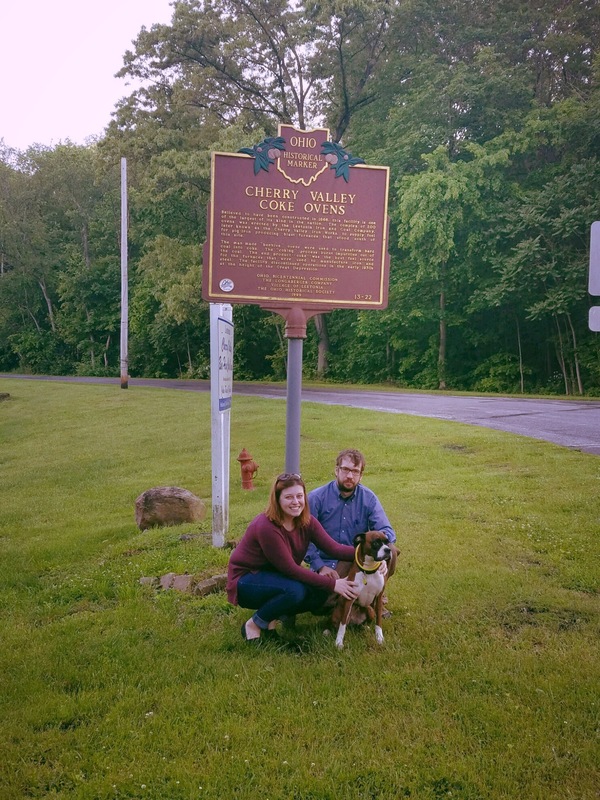 Darlington (the dog) joined us on her first marker search today as we finished up Mahoning County. We think she had a great time! Be sure to stay up to date with us so you don’t miss our post on the county that was once known for its steel industry. We visited many amazing sites on this trip, and the history tells an interesting narrative. Follow us here on WordPress, Facebook, Twitter, and Instagram to keep up on our posts and awesome adventures! See you at the next marker.